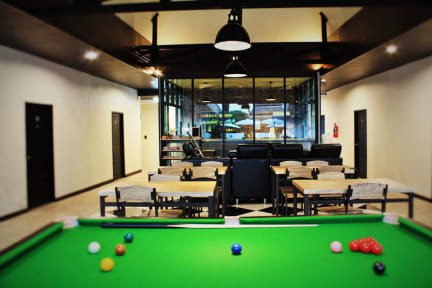 Mercy Hostel is located in the heart of Chiang Rai, only 600 m from the Clock Tower and the Fresh market(10mins walk), 700 m from the Old Bus Station and 800 m from Saturday Night Walking Street. Mae Fah Luang – Chiang Rai International Airport is 10 km away. There are many restaurants and bars in this area, within 5 mins walk! Mercy Hostel is the best place to RELAX after a long journey. Our big terrace, on the premise, comes with a shallow pool where you can take a refreshing DIP. And, because we're in the small allay, just a little bit off the main road, it gives you the PERFECT sleeping night. We have only 1 floor so no need of climbing stairs, and our terrace come with a small reflecting pool and sunbathing mattresses. Our 10 dormitory rooms are furnished with Air-conditioning, individual lockers, individual light, hotel quality beds and blankets. Our female bathrooms are secured by an automatic door. We also have a small billiard table, cable TV, board games, guitar, etc. Our common kitchen provides you kitchenware, microwave, refrigerator, FREE coffee, tea and drinking water. We also have a big screen television with cable TV so you can enjoy a movie night here as well. Wi-fi is FREE throughout the building. And, on top of it all, our friendly local staff work 24/7. They will ensure that you have the most memorable stay in Chiang Rai. They'll help you plan your day and let you know about the events happening in the city. They'll do anything they can to make sure you are comfortable at the hostel. If you need anything, just ask. 2) This property only accepts cash payments. 3) 2 days advance notice for free cancellation. Excellent hostel! Extremely clean, good facilities, gym, and very helpful staff. This is place is great! The beds are comfy! Everyone one of them has a privacy curtain. There are so many different hang out spots. Fantastic hostel. Great staff and atmosphere. Very clean and spacious. My first hostel experience in 10 years, and they know how to do things. Everything was wonderful, felt safe, and staff was always very helpful. A bit of a walk from the market and bus terminal but all in all a nice location. Beds are comfortable and clean. Nice common area with some games and cool pool area, however we did not swim as it was a bit dirty when we were there. Clean bathrooms and big staff who is always keeping it tidy. Nice little kitchen area (no stove) but basic amenities. We had a short stay but it was a nice one. This place was really nice ans clean. Its a little bit to walk to get to certain places which is a bit of a mission in the heat but otherwise no problem. Staff is really friendly and helpful. I liked that it has a nice and big common area to chill and meet new people. 10 mins walk from Chiang Rai Bus Terminal 1.. But it's quite secluded in a neighbourhood area.. Provides towel at a rental fee of 30B.. Overall a quiet place without noises of vehicles at night.. But be sure to spray mosquito repellent as there is an army of them flying around..
Neat place with everything you need. Only issue I could think of is that the A/C in one of the dorm rooms is really noisy. Loved the fitness center. Very very safe for all your stuff and everything else, you’ll see why if you go. Great little kitchen if you want to utilize it. Beds were comfy and staff was helpful. Gym was great! Loved the fact they had a whiteboard to make plans with others, perfect for solo travelling .